For all its really great bits, becoming a mum is hard work. Having just waddled your way through nine months of growing, carrying and then – you know – birthing a small human, you are thrust head first into sleepless nights, endless nappy changes and figuring out how you’re supposed to keep this tiny person alive. Anything that makes the job even a little easier is very welcome indeed. Startup Elvie’s latest wearable device wants to do just that. Following on from the success of its pelvic floor trainer, Elvie has produced its first wireless, wearable breast pump. And for any breastfeeding mums out there, that’s kind of a big deal. That’s because whether you’re looking to return to work, or just want the option of a night off now and then, expressing is going to play a big part in your routine. Offering expressed milk for the times you’re away is often the preferred option to introducing formula, plus expressing when you can’t be with your baby is key to keeping your supply up. The problem is that expressing is time consuming (and us parents just have stacks of spare time, don’t you know), not to mention that most of the current pump options are noisy, inconvenient and just not very nice to use. My daughter is currently 16 weeks old and I’ve been using a breast pump to get my “freezer stash” of milk established to give me some flexibility whenever I need it. But I was curious as to how being untethered from the inconveniences of a traditional pump would improve my experience, and whether it could – ultimately – help breastfeeding Mums to breastfeed for longer. Here’s how I got on with Elvie's Pump. Compared with just about any other electric breast pump, the Elvie Pump is nothing short of revolutionary. Whereas most traditional options are made up of a separate, often mains-powered pumping unit with a wired pumping attachment that you hold to your breast, the Elvie Pump is an all-in-one wireless and hands-free unit that sits inside your bra. It’s a compact, teardrop-shaped device, with the top half made up of the main pumping unit – or the ‘hub’ – and the pumping attachment (which Elvie calls the ‘breast shield’) slotting discreetly into the back of it. At the bottom is the collection bottle, capable of storing up to 5oz/150ml of milk. You get two of these containers in the box, along with two lids for easy storage. You also get two breast shields in a choice of 24mm and 28mm, with instructions in the app and manual to make sure you use the right size for you. It’s important that you pick carefully here, as you’ll get the best yield from your pumps when you’re using the shield that properly fits your breast. After measuring up against the lines on the breast shield as directed, I discovered I was more suited to the 21mm shield, which Elvie sells separately in its store. It’s a hugely clever design, and it’s also lightweight and comfortable to wear. It comes with two bra strap extenders for making room for it in your bra if you need them, but I didn’t find that necessary – my nursing bra had enough stretch to make way for it and hold it securely in place. Is it discreet? Yes, but I wouldn’t say the way it sat on me was entirely undetectable for anyone looking out for it. Pick your clothing wisely when you’re wearing it though, and you’ll likely keep your pumping a secret if you wish – also helped by the fact it’s almost entirely silent in use. A large part of the Elvie Pump’s appeal is its app control, but if you’d prefer not to use it (or your phone is out of battery), you can also control the power, suction and what side you’re pumping from (more on that shortly) directly on the unit. There are a couple of notification lights too, one around the main play/pause button and two further down to show which side it is recording the pump from. If anything it’s the main light here that might give the game away through your top rather than the shape or sound, but tuck it far enough inside your bra and you should be fine. I tested the single Elvie Pump ($279, but you can also buy a double, which is basically just two identical units so you can pump from both breasts at the same time. At $479 though, the price is pretty steep, and unless you’re following a strict pumping schedule, I’m not sure it’s really necessary. Since you’re not tethered to the restrictions of a traditional machine, you can simply switch the Pump between breasts wherever you are, whenever suits. Although you can use the Elvie Pump entirely independently of its control app, of course the idea is that the two go hand in hand. Once connected to your Pump via Bluetooth, the app allows you to control all the Pump’s settings from your phone, as well as gives you a real-time indication of how much milk you’ve expressed, the remaining battery life and how long you’ve been pumping. Once you’ve recorded a pumping session, it’s stored in your history so you can look back at what you’ve expressed, from which side and when. 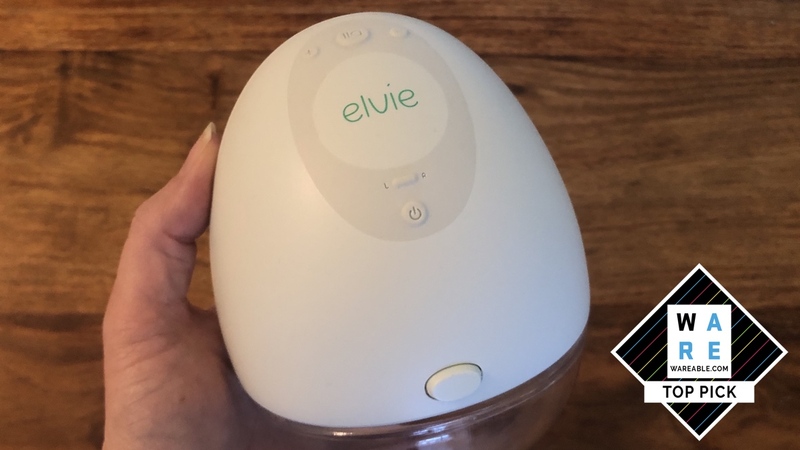 The idea is that this is done automatically by Elvie’s built-in sensors (which will also switch the pump off if it notices the bottle is full), but I found its accuracy to be a bit hit and miss. It’s worth checking that the numbers it’s suggesting are accurate before saving them – you can edit them afterwards if you need to. Overall, I found the app nice to look at and easy to use, but with a few early bugs that still need to be ironed out. While they don’t affect how well the Pump runs, the overall experience of using it will be better once they are resolved. Firstly, the timer regularly loses track of itself and displays a long string of numbers instead of a valid time on the Controls page. That means that unless you noticed what time you started pumping, you can’t be sure how long it’s been by looking in the app. Stop and save your session and the correct time does appear, but this little hiccup allows the Elvie Pump to run for longer than it’s supposed to – the manual says it has an automatic cut-off time of 40 minutes, but I ran it for more than 50 minutes without a problem. This didn’t have any negative effect on the pump that I noticed (it runs just slightly warm as standard, and didn’t get any hotter with the extra workload), but whether it would affect the Pump’s lifespan over a longer time, I’m not sure – Elvie itself recommends leaving 30 minutes between each 40-minute pumping session. The other issue concerns side selection. If you want to switch breasts during a pumping session, you press a button on the Elvie Pump so it can initiate the Stimulation Mode again, a faster pump designed to encourage your letdown (the milk ejection reflex). This should also start a fresh timer for the new side, so at the end you can see how long you pumped on each breast. However, while the timer in the app does go back to zero after the switch, when you come to save the pump at the end of the session, the sides aren’t separated out – your entire pumping time is attributed to whatever side you finished on. Even more annoying is that there is no way to edit that part of your data. Pumping both sides on a single session also confuses the sensors – if you want to know how much milk you’ve pumped from each side individually, you’ll probably want make a note of the amounts yourself to be accurate. If you can forgive some of the app’s current (and hopefully short-lived) shortcomings, the rest of the Elvie Pump experience is a very positive one indeed. If you’ve ever expressed and had reservations about the experience, the Elvie Pump solves all of them entirely. The most obvious one of these is the freedom it gives you to pump wherever you want. I pumped in the car, while doing the housework, while feeding and changing my daughter, and never experienced a single leak. It was a revelation after losing many hours stuck on the sofa with no hands to do anything else. It’s also very quiet – you can hear a very subtle hiss from the pump if you’re really listening out for it, but add in environmental noise and clothes, and it becomes entirely undetectable. Compare it to the racket my traditional pump makes and the Elvie Pump’s claims of being silent are fair. If you’re used to a strong suction from your current pump, the Elvie Pump is very gentle by comparison. That’s not a bad thing – women sometimes think they have to whack a pump up really high to get the best results, but you can actually negatively affect milk flow that way (not to mention bruise your nips… ouch). That said, I find Elvie’s strongest setting worked the best for me, and despite feeling significantly gentler than my traditional pump, I would say I get a similar yield from each one. Just make sure the Pump is sitting snug against your skin to get the most from it – if it shifts during wear (which I noticed it could do if I was moving around a lot), you might feel a reduction in the suction, and you should adjust it back to ensure you’re getting the most from it. Getting the fit and alignment right with the Elvie is a bit more fiddly than with a traditional pump, due to the design being so enclosed. Elvie recommends lining up the see-through shield with your breast first and then slotting the hub onto it for the most accurate positioning. That’s fine, but once on, it’s hard to keep an eye on things, to ensure the position hasn’t changed mid-pump. If something doesn’t feel right, do address it immediately – as with any pump, trying to power through with improper positioning will only leave you feeling sore. Similarly the design makes it hard to know when your flow has slowed down, when it is usually recommended to stop pumping. The real-time indicators in the app give you some idea when the amount collected is steadying, but as I’ve already mentioned, they aren’t always reliable, particularly if you’re not sitting still. As for battery life, the Elvie takes around two hours to charge and at the highest suction, drops about one percent a minute in use. I’ve usually managed three sessions before needing to recharge, though this will of course depend on your chosen suction level and length of pumping session. It’s no overstatement to say the Elvie Pump completely changes the expressing experience. What is usually a frustrating, time-consuming process is revolutionised by the Elvie’s wireless convenience. It’s not cheap, and there are app niggles that need sorting, but for breastfeeding or exclusively-pumping mums, it is a huge step forward from the other breast pump options currently available.